The album is a tribute to the figure of Chet Baker to celebrate the thirtieth anniversary of his death. In "Thirty Years" the melancholy and introspective side of the trumpet player is told. The contrast between the disorder of his existence and the beauty of his music are the inspiration of Gaetano Valli, leader of the Tre Per Chet trio. 30 years ago one of the biggest and tormented artists of all time was dying from a window. 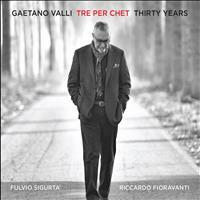 On May 13th 2018 "Thirty Years" -the second album by Tre Per Chet, trio led by the guitarist Gaetano Valli.- is released. Made at Stefano Amerio's Artesuono Recording Studios, the album contains compositions and songs performed by Chet Baker and some original pieces by Valli. "I have always wondered how a tormented musician, a vagabond, a slave to drugs, could produce so much poetry. This dissociation between life and music has produced an expressive quality that in my opinion remains unmatched. " "... but the years of maturity are those that in my opinion offer us the most fascinating part of his music. Where the technique is resized, even for physical reasons, and the desire to excel with the instrument is abandoned, the need arises to express an inner world that is made of poetry and pathos. In this direction goes the intimate form of the trio and, in particular, the formation with the guitar, an instrument that is also intimate and more discreet than the piano. " Together with Gaetano Valli, the trumpet player Fulvio Sigurtà and the double bass player Riccardo Fioravanti are part of the project. The common goal of the three is to give voice to the more melancholic and introspective side of the trumpet player, singer and composer. "After the first happy experience with Marco Brioschi, Fulvio's contribution has been crucial to succeed in making the Tre per Chet project evolve from the sounds associated with the first period to the softer and more introspective ones of the last stylistic phase." "Like all great bass players, Riccardo knows exactly how to move. Aware of the importance of his role, he has made a fundamental contribution to directing the project, not neglecting the structural and "substance" part of the rhythmic-harmonic accompaniment and adding always refined and intelligent soloist interventions. " Go inside the project taking a look to the video interview made by Gaetano Valli. Just click here.